Young gun Alex Lynskey has completed an incredible week here in The Star Poker Room, taking out the inaugural Australasian Poker Challenge after an epic heads-up battle with Ray Lapitan. Lynskey came into the final day as chip leader of the 36 remaining players and although the day was somewhat of a roller coaster he managed to show his class when it mattered most to continue his exceptional start to 2016. The youngster had already won the Opening Event earlier in the week and went one better in outlasting the 444 starters to take out the Main Event as well. Congrats to Alex on a sensational performance! On an 8♠2♦J♠ flop, Ray Lapitan bet 435,000 and Alex Lynskey raised to 1.2 million. Lapitan then announced he was all-in and Lynskey snap-called. It was Lynskey in the driver’s seat holding 22 but needing to dodge the flush draw with Lapitan showing A♠7♠. Lynskey didn’t have to sweat too much as another 2 on the turn gave him quads and locked up the win. There’s not a whole lot to report at the moment, with each player taking small pots from one another and the chip stacks generally staying fairly stagnant. Alex Lynskey is still chip leader with a touch over 9 million while Ray Lapitan has around 4 million. Alex Lynskey looked to have Ray Lapitan on the ropes but the latter has fought back somewhat over the past 15 minutes or so, winning a number of tidy pots. He is back up over 4 million although still facing a 2:1 deficit. Blinds are up to 50,000/100,000 with a 10,000 ante. 10.35pm: Big call from Lynskey! On a 238 flop, Alex Lynskey bet 390,000 and Ray Lapitan called. Boty players checked the Q turn before Lapitan bet 850,000 on the river. Lynskey tanked before eventually calling with J5 which was good enough to take down the pot against the 9T of Lapitan! Alex Lynskey has moved into the chip lead after picking off a couple of bluffs from Ray Lapitan. The biggest saw Lynskey bet 500,000 on the river of a QJ225 board then call Lapitan’s 1.6 million re-raise holding QJ. Lapitan flashed A6 to drop to 4.3 million. Lynskey has 9 million. Short stack Andy Lee snap-called Ray Lapitan’s shove holding 99 and found himself in a race against Lapitan’s AQ. His run was to come to an end however with the board running out 25Q37 to leave us heads up! Players are back to find blinds now at 40,000/80,000 with a 10,000 ante. On an 8♥4♦2♥ flop, Alex Lynskey and Ray Lapitano got it in with Lapitan ahead with AA but needing to dodge outs against the T♥5♥ of Lynskey. The board bricked and Lapitan moves up to 3.3 million. After Ray Lapitan raised on the button to 120,000, Andy Lee 3-bet to 375,000 from the small blind. Alex Lynskey then 4-bet to 925,000. Lee thought for 30 seconds then announced he was all-in. Lynskey snap-called with QQ as Lee sheepishly showed 8♦9♦. The 47T flop brought a sweat for Lynskey but the turn and river bricked to completely change the momentum of this final table. Andy Lee continues to apply relentless pressure here three-handed and has built his stack up to 8 million as he becomes the dominant chip leader. Both Lynskey and Lapitan sit just under 2.5 million. On a 4♦T♦5♦7♦Q♥ board, Andy Lee check-raised Alex Lynskey’s 200,000 flop bet to 500,000 with Lynskey making the call. Lee fired 650,000 on the turn which Lynskey called before announcing he was all-in on the river. Lynskey folded. Level 27 – 30,000/60,000 with a 10,000 ante. Andy Lee raised to 125,000 on the button and James Rann called in the small blind. Alex Lynskey then 3-bet to 400,000. Lee called but Rann shoved with Lynskey quickly-calling. Lee folded. It was Rann’s 88 against the AK of Lynskey and when the board ran out A-high Rann hit the rail. Lynskey soars to 5.9 million after that hand. Aside from the $221,112 first prize and a shiny trophy, the winner of the Australasian Poker Challenge main Event will take home a gorgeous gold ring courtesy of Cerrone. The ring boasts diamonds and rubies and is worth $9,500! On a Q♣T♠T♥7♣ board, Andy Lee bet 175,000 and Peco Stojanovski shoved. Lee tank-called and showed QJ with Stojanovski still boasting plenty of outs with A♣5♣. The 3♠ on the river wasn’t one of them and we’re down to 4! Zhi Ma shoved for his remaining 545,000 with AK and Alex Lynskey made the call with 44. The board ran out 9Q3J2 to send Ma to the rail. Lynskey is back up to 2.8 million. James Rann opened to 100,000 on the button and received calls from both Alex Lynskey in the small blind and Ray Lapitan in the big. They saw a flop of T57 and Rann bet 150,000 when checked to. Both players called. A 2 landed on the turn and this time Rann bet 360,000. Only Lynskey called. When the turn came an 8, Lynskey checked but Rann went deep into the tank, shuffling his chips at one point before finally checking and showing AA to take down the pot from Lynskey’s T7. Andy Lee opened to 125,000 and James Rann shoved for his remaining 800,000. Lee called to find his 77 racing against Rann’s AQ. The board ran out K5J5Q as the river gives Rann a much-needed double-up. He now has 1.7 million. James Rann opened to 100,000 before Ray lapitan 3-bet on the button to 245,000. Peco “The Magician” Stojanovski then shoved from the small blind with Rann instantly folding. Lapitan went deep into the tank however before finally throwing his cards into the muck. Players are back from the break with blinds at 25,000/50,000 with a 5,000 ante. Our remaining 6 players are now on a 20 minute break, their stacks are as follows. On our last hand before break time a monster was brewing between Andy and Ray, with the board reading T3T74 and over 1 million in the pot already, Ray fires 1,100,000 on the river and eventually Andy makes the call. “Good Call” said Ray peeling over Q9 off with Andy opening pocket KK’s. Ray Lapitan opened to 105,000 before Peco Stojanovski 3-bet to 300,000. Lapitan called and they saw a flop of 475. Lapitan checked and The Magician bet 250,000 which sent Lapitan deep into the tank. After a good three minutes, Lapitan mucked his cards as Peco moves to 2.1 million. Andy Lee has just taken a hefty chunk of Alex Lynskey’s stack. On a 3AAQ6 board, Lee bet 150,000 with Lynskey re-raising to 650,000. Lee called and showed A5 to take down the pot over Lynskey’s JJ. Zhi Ma has doubled on consecutive hands to move up to 1 million in chips and buy himself some breathing space. Having seen his A6 hold on against the J9 of Ray Lapitan, he was all-in again with JJ against the AT of Alex Lynskey. The board ran out T-high to keep Zhi alive. From the button, Andy Lee shoved over the two short stacks with Zhi Ma folding but Nick Polias making the call. It was Lee’s 57 against the AT of Polias and the board cruelly ran out 2347J to end Polias’ run in 7th. Blinds are up to 20,000/40,000 with a 5,000 ante. On a Q9752 board, Andy Lee fired on every street including a bet of 175,000 on the river. James Rann eventually made the river call and Lee instantly mucked. Suraj Dutt opened UTG to 70,000 and Andy Lee called UTG+1. Alex Lynskey then 3-bet out of the blinds to 245,000. Dutt thought broiefly before announcing he was all-in for another 250,000 on top. Lee folded but Lynskey called to find his TT well ahead of the 88 of Dutt. The board ran out 4672T and we’re down to 7 runners! Peco Stojanovski opened in the cut-off and Suraj Dutt 3-bet on the button. Stojanovski then announced he was all-in for around 500,000 and Dutt called. It was Stojanovski’s AJ racing against the 44 of Dutt with an A on the flop enough to ship the pot his way. Nick Polias opened to 60,000 and Alex Lynskey 3-bet on the button to 190,000. That saw Polias 4-bet to 400,000 with Lynskey announcing he was all-in. Polias called and showed KK to be in great shape against the AJ of Lynskey but an A on the flop changed all that to ship the huge pot Lynskey. Polias is left with just 150,000. Down to just two big blinds, Rined Namrood shoved with KJ and was called by Alex Lynskey and Ray Lapitan. Lapitan forced Lynskey away on an 899A board holding Q9 and when no K or J appeared on the river, Namrood’s race was run. Blinds are up to 15,000/30,000 with a 5,000 ante. The first big clash of the final table has left Rined Namrood crippled. It was Namrood’s AJ against the 99 of Polias all-in pre, with a 9 on the flop enough for Polias to climb to 1.25 million. 5.20pm: Final table is underway! The final table is underway! Blinds are at 12,000/24,000 with 4,000 ante. Mayra Ramos’ great run has finally come to an end on the final table bubble! She was all-in for her last 450,000 with A3 against the KT of Lynskey and when the board ran out JK265 we were down to our final 9! Anthony Koutiskos is our latest casualty, shipping his last 400,000 with 88 to be racing against the A9 of Andy Lee. The board ran out T593J to send Koutoskos to the rail. We’re not down to 10 and on the final table bubble! The eliminations keep coming thick and fast as Chris Moussa hits the rail. Moussa shipped his final 130,000 with QJ and ran into the KK of Zhi Ma. A Q on the flop gave him hope but the turn and river bricked to cut the field to 11! “Toothpick” Tony Kambouroglou has been eliminated in brutal fashion. A pre-flop raising war with Suraj Dutt saw a monster 2 million chip pot built and when the cards went in Kambouroglou was in great position to double up with AA against the KJ of Dutt. The flop was all low cards and appeared safe for Kambouroglou but a J on the turn gave him a sweat before a K on the river completed the knock-out punch. In the meantime, Dutt storms into the chip lead with 2.2 million! Blinds are up to 12,000/24,000 with a 4,000 ante. Alex Lynskey shoved over a short-stacked Sayed Jabbour from the small blind with Q9 and Jabbour called from the big with KJ. Jabbour was a small favorite to win the hand but the board ran out 648T7 to give Lynskey a straight and send Jabbour to the rail. Moments after Francesco Serai’s elimination, Daniel Levy was faced with an all-in bet from Rined Namrood on an AK847 board. Levy eventually called with AJ but needed help against the A4 of Namrood. The river was a meaningless 7 and Levy exits, stage left! Namrood moves to 1 million. Francesco Serai shoved for his last 109,000 holding 44 and was called by James Rann with QQ. The board ran out K72AJ to send Serai to the rail. Rann is up to 1.1 million. David Sanis has hit the rail after shipping it over the top of Suraj Dutt with KJ and running into Dutt’s KK. There was no miracle to be had for Sanis who hits the rail in 18th. Dutt is up to 1.5 million. Nick Polias opened to 42,000 on the button and found calls from both Mayra Ramos in the small blind and Con Angelakis in the big. The flop fell TT9 and Angelakis shoved for 238,000. Polias folded but Ramos called and showed Angelakis the bad news with her 8T – well ahead of his 97. With his elimination we’re down to 18 players and have redrawn for the final two tables. Players have taken their seats with blinds recommencing at 10,000/20,000 with a 3000 ante. Players are on their first 10 minute break of the day with 19 players remaining. Not long after being crippled Kim’s remaining chips went in with AQ receiving a caller in chipped up andy Lee with K5, the board fell 4K659 sending Kim to the rail. Angelina Rich’s run has come to an end, much to the disappointment of the male contingent at the table. Rich shipped J7 from the small blind for her last 170,000 and was called by Suraj Dutt in the big blind holding K6. The board bricked and she hits the rail in 20th. Mayra Ramos shoved with QJ from the button and was called by Sayed Jabbour with AJ. Jabbour was in great shape to send Ramos to the rail but a Q on the flop changed all that as Ramos scooped the pot to move to 320,000. Jabbour is down to 110,000. Tony Kambouroglou doubles through David Sanis with AQ against David’s AJ. in Sanis a cry for a jack was made but never came with the turn and river falling K2. On an A932A board, Daniel Levy and Kim Myunhoon got it all-in with Myunghoon confidently flipping over A6. It was no good thought with Levy’s A3 filling him up on the river to leave Myunghoon with just 180,000 remaining. Levy is back up to 830,000. Andy Lee has been applying the pressure and recently forced Daniel Levy into a tough fold. On an AK7 4 board, Lee bet 100,000 and Levy re-raised to 220,000. Lee then announced he was all-in with Levy folding. Lee moves to 1.55 million while Levy is down to 380,000. Peco Stojanovski doubles to 550,000 after he moved all in with 66’s on a 65J flop, his opponent made the call with KJ and was unable to improve with a 34 turn and river. Alex Fallon has been sent packing after running heads up with a chipped up David Sanis. moving his chipcount to 1,275,000. Blinds are up to 8,000/16,000 with a 2,000 ante. The redraw that took place to bring us to the final three tables has seen a heavy distribution of chips to Table 75. It includes James Rann with 1.1 million, Alex Lynskey with 915,000, Andy Lee with 1.3 million, Daniel Levy with 950,000 and Ray Lapitan with 1.64 million. To put that into perspective, the average chip stack with 25 players remaining is just 532,000! Jarrad Graham doubles through Kim Myunghoon after a little help on the turn and river. and 8 on the river were very well received. Jarrad now on 175,000 and still the shortest on his table. Ben Benoit has been sent packing at the hands of Andy Lee and his AA. Lee is now upwards of 1,300,000 in chips. We’ve just witnessed a crazy hand play out that has seen two players eliminated in the one hand! It began with Ciaran Sharpe opening on the button and Matthew Wakeman 3-betting from the small blind. Ray Lapitan (pictured) then shoves from the big blind with Sharpe shoving over the top. Wakeman snap-called and when the cards were shown it was a case of AA v KK v QQ! Wakeman was in pole position win a huge pot with the pocket rockets but it was Lapitan flopping gold as the board ran out JQ582! Wakeman and Sharpe were sent to the rail while Lapitan surges to a whopping 1.69 million in one hit! WSOP bracelet winner Andrew Hinrichsen shoved with 88 and was called by Daniel Levy with AJ. The board ran out J4QQ5 and Hinrichsen hits the rail. We’re down to 28! And another one bites the dust! Jamaal Ishac got it all in with K9 but ran into the AA of Kim Myunghoon to exit in 30th! Henry Wang and Sam Khouiss are the latest to fall. Khouiss was particularly unlucky, running KK into the AA of James Rann (pictured). Having begun with 286,000 just 25 minutes ago, Rann is now sitting on just over 1 million in chips! 12.45pm: Another two follow straight away! It’s all happening here in the first few minutes of the day’s play. Paul Tartak joined tablemate Bernie Stang on the rail when he shoved K3 and was called by Alex Lynskey with 88, then a third player from the same table, Bruce Hall, was sent packing a well. Hall ran QQ into the AA of Joe Khazen and when an A landed on the flop it was all opver for Hall. Play is just 13 minutes old today and we’ve already lost four of our 36 players! We’ve lost two players within the first couple of hands! Bernie Stang was first to go, getting it in with A7 against the TT of David Sanis and finding no help from the board. Moments later Matthew Wakeman opened in late position with Brandon Smith shoving over the top. James Rann then re-shoved with Wakeman folding. It was Rann’s AK against the AQ of Smith and when the board ran out 9T48T we were down to 34! 12.33pm: Cards are in the air! The table re-draw has been completed and play is underway! 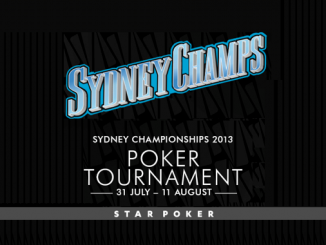 Hello and welcome to PokerMedia’s live coverage of Day 3 of the inaugural Australasian Poker Challenge Main Event. Today is championship day with 36 players returning with dreams of ending the day as APC main Event champion. Among them are plenty of familiar faces including Jarred Graham, Billy Argyros, Andrew Hinrichsen, Sam Khouiss, Tony Kambouroglou, Daniel Levy, Andy Lee, Nick Polias and Matthew Wakeman. Leading the way however is none other than Alex Lynskey. 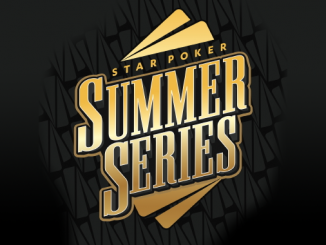 Having already won the Opening Event this week, Lynskey is the only player sitting above 1 million in chips and starts Day 3 a whopping 350,000 chips clear of his nearest rival, Rined Namrood. 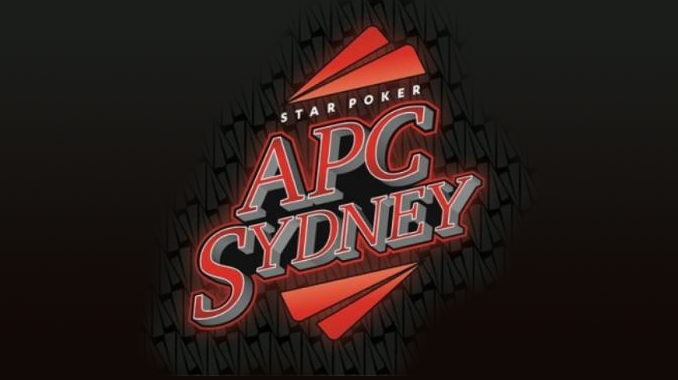 It’s going to be a long day in The Star Poker Room but with the rain pouring down outside, what better way to spend the day than by following PokerMedia Australia as we bring you all the live action from the final day of the APC Main Event!